Darlings, to the left prepare to fall head over heels (no pun intended!) for Christian Louboutin’s luscious Leopard Print Ankle Boots; to the right, brace yourself for the beauty that is Charlotte Russe’s Suede Leopard Bootie. While the Charlotte Russe charmers lack the cherry red sole of the lovely Louboutin’s, and are constructed out of faux suede as opposed to true pony hair; for a mere $35.50, in comparison to the $1,449.50 required to make the ravishing Loubies your very own, they are every bit as capable of lending the purrr-fect form of ferocity to your look du jour at a price that the frugalista simply cannot refuse! Thanks to Saks Fifth Avenue and Charlotte Russe for the pictures. Oh, if I could I would totally go for the Louboutins! You know me! Seriously, Erika, you are amazing because I was just browsing through the internet looking for booties that I so desperately need for my surprise and I was not sure where to look. Lo and behold, you post this and, again, have saved me from a fashion overspending. Am going to have to go for the Loubs on this one, darling! Honestly, I find Charlotte's more cool with the platform. What a beautiful cool look from the CR collection. YaY SHOES!! Have to say...I actually like the Charlotte Russe ones, especially the price! WOWZA! Louboutin is AMAZING for it is not affordable for everyone!! but sometimes there are another brands less expensive with same result! I love the chunky shape of the Charlotte Russe but oh those red heels and sleek shape of the CLs! I really think I might need to get on the leopard kick...these shoes are stunning. I think I'd like to save up for the Loubies! Wow! I'm really impressed with this find. What a steal! Charlotte Russe in my opinion are way better. The platform looks betters...I like the print better. No splurging here! The CR's totally work! RAWR! thanks always for stopping by and being supportive- it means a lot! today ive been working at a preschool.. but came home so tired- slept like 2 hours.. its the dark outside that make me so tired these days..
about them shoes, even if i couldn't walk in any i would choose the russe ones. Now I need a leopard print dress to go with them! 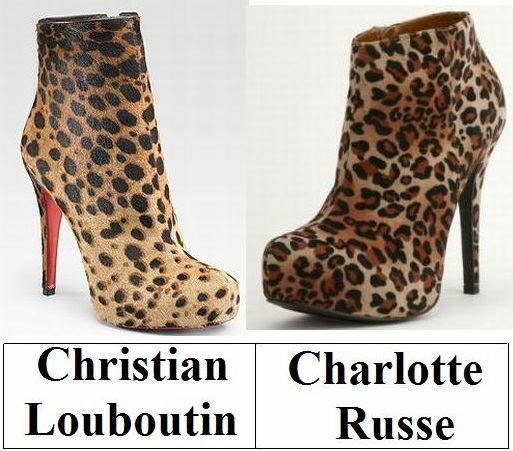 The Charlotte Russe boots are just a bit more sexier, even though I would pretty much buy anything that had Louboutin's name on it. You've now got me dreaming of leopard booties... I want the Loubies so bad.. but they are out of reach.. at least for the time being. hee hee. I love these boots. There are few things nicer than Christian Louboutin...so I got to go with those even at that price! i would definitely go for the louboutins! I would definitely get the Loubouts if I could afford them. i think they are pretty different so i would consider getting both, especially since it's faux. I love Charlotte Russe to death,but I sooo want the Louboutins'! Those are gorgeous. And yes. The Louboutins. Awesome find - they really are so similar! Wow, I cannot believe teh Charlotte Russe booties, plus they are eco-friendly. Both are nice, but a little too spike-y for me! Oh I love these boots. I don't usually wear heels because I am too lazy BUT these are rad. lust lust lusting these shoes!! 35.50 is such a steal.. needing to add a pair of these to my wardrobe within the next couple of days!! Check out our amazing Sebastian giveaway on WanderLust! I must say, you just can't beat a pair of Louboutins. oh my god, i may HAVE to buy those booties!! I still haven't figured out how to properly wear statement shoes, so I'll have to go with neither. Sad times. These with a sleek black trench coat would be PERFECTION. Omg. well... the price difference makes me obviously pick the cheaper ones but holy hell, seeing them together- you can really see the beauty in the finely made pair, I want them! I'm going with thrifty, what a great find!! I think an every day shoe would be more of a reason to purchase the expensive ones, but since this only goes with certain outfits I think the cheaper ones are just as good! I am having a LANVIN Silk shirt Giveaway on my blog, so stop by and enter if you like! I love leopard print heels! These are both beautiful I would definitely buy the Louboutins! charlotte russe def!!! i need some leopard print in my life soon I think. have a happy friday!!! I prefer the pattern on the Louboutin and the shape of the shoe, but no way would I pay that kind of money for an ankle boot that I couldn't wear all the time. So I'd go for the frugal option this time! Heck, I'd take either one!! I LOVE leopard print! great find, as always Erika. Not really liking either of these, but if I had to choose, it's be Louboutin. The Russe seems a bit harsh. The Louboutin's are certainly gorgeous, but the Charlotte Russe are definitely more within by budget. Ok I never thought I would say this, being a diehard Louboutin fan (not that I own any) but I kind of prefer Charlotte Russe's version... I feel like a traitor! my name's martina and I like so much your blog...do you like fashion? I'm a fashion victim! You know what, i really like that Charlotte Russe ankle boot and it is affordable. Great affordable find. I don't know if I'd ever wear these, it's too much animal print for me. I usually stick to scarves or something very subtle. But they almost look like the Loubs.. nice!